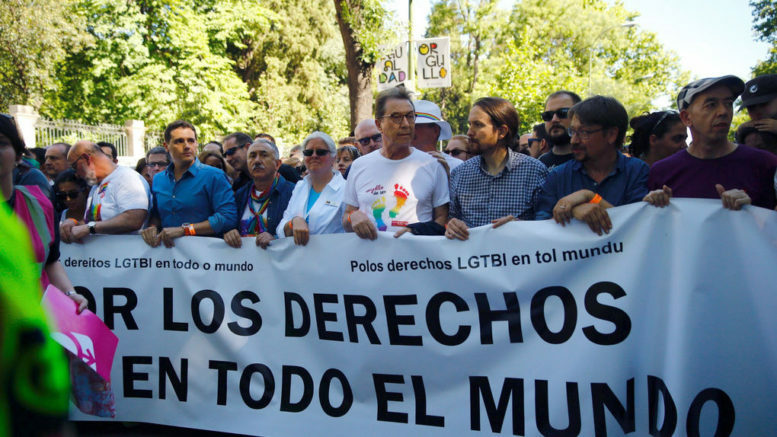 Twenty-six Spanish non-governmental organisations and trade unions have called on political parties in Spain’s Congress to move forward for the immediate approval of a new LGBTI Equality Law, proposed in September but said to be currently stalled in committee as a result of repeated calls for amendment from congressional deputies belonging to the governing Partido Popular (PP) and two deputies belonging to the Unión del Pueblo Navarro (UPN, or Navarre People’s Union) party. Introduced in mid-September by Unidos Podemos and supported by all other political parties in Congress with the exception of the PP and UPN, the proposed national LGBTI Equality Law would provide new rights to transgender minors nationwide, allowing anyone from the age of 16 to access surgical sexual reassignment without parental consent. The new law, if approved, would also enable minors to begin hormonal treatment as part of the process of sexual reassignment from the age of puberty and would allow transgender minors to have the sexual identity of their choice listed on government documents and to be treated as a member of their chosen gender at school and in other areas of public life. In a letter sent to Spain’s political parties Wednesday, the 26 NGO and labour organization signatories said that the deadline for presentation of amendments to the new law should have been closed already and that proposed partial amendments expected from the Socialist party (PSOE), Ciudadanos and the Partido Nacionalista Vasco should have been submitted by now. The organizations also noted that while but PP has said it would present an “amendment to the whole”, the party has not yet done so — but instead has voted to extend the deadline for presentation of amendments on 11 separate occasions. Promoted by the National Federation of Lesbians, Gays, Transsexuals and Bisexuals (FELGTB), the letter was signed by a broad range of Spanish NGOs, including among others Amnesty International, the Spanish Confederation of Associations of Parents of Students (CEAPA), the Spanish Commission for Refugee Aid (CEAR), Save the Children, Mensajeros de la Paz (Messengers of Peace) and labour representatives from the Comisiones Obreras (CCOO, Workers’ Commissions), the Unión General de Trabajadores (UGT, General Union of Workers) and the National Union of Chiefs and Local Police Officers (Unijepol).